Wow, that's big! 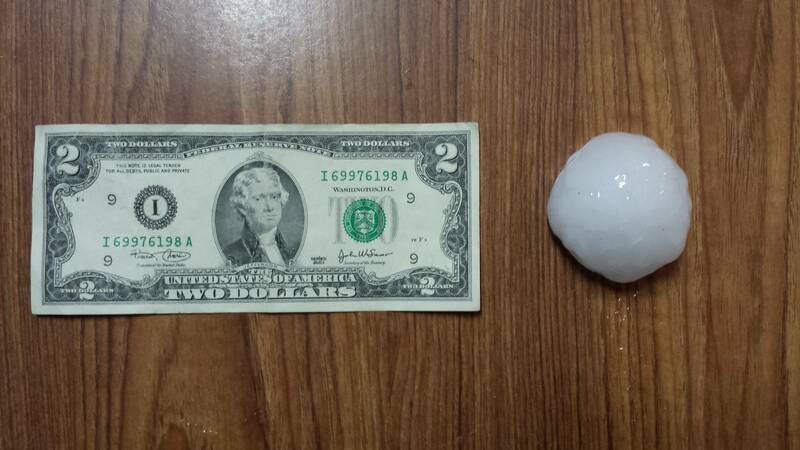 I've heard of hailstones being quarter-sized, but that's a two-dollar bill! The three hurricanes that hit Central Florida in 2004. I was a passenger driving from outside Baltimore to outside New York in Gloria back in 1985. We never should have kept going. Heavy rain reduces visibility more than almost anything else in my opinion. Also followed a line of rainstorms across Illinois once that had me guessing where the jersey barrier was. Never again (I hope). But for scariest, I second the October snowstorm of 2011, for which I was in North Jersey. It happened much heavier and faster than predicted, and suddenly you had people trying to escape their normal Saturday routines before trees fell on them. A tree fell in front of my truck, so I detoured and was waved off by firemen because of a large electrical fire in the middle of an intersection, then noticed on my third choice that the treetops were on fire from collapsing onto power lines. It was hard to know where to park, and the sound of trees steadily falling all over made it sound like bombs were falling. What an incredible difference leaves make. Me too. I was on I-55 heading northbound when a state trooper came flying up in the left lane. He slowed just enough to yell TORNADO and point over his shoulder and then he left me in the dust. Once I was sure I was clear of danger and I turned around and went back towards Plainfield. Utter devastation. Since then I have been through every hurricane to hit eastern NC since Bertha in 1996, and I spent the night of April 14 2011 at the Days Inn in Sallisaw OK while a tornado wiped out a town about 30 miles away and we thought it was headed for us (it wasn't, it was a seperate smaller thunderstorm)-that was probably the most scared I have ever been during a weather event. This particular storm system "chased" me all the way from OK to NC (it rained from Memphis all the way to Asheville, a miserable day) on April 15, and then the afternoon of the 16th a tornado took out a subdivsion between New Bern and Havelock on US-70. My friends joked that I brought the tornadoes home with me-we usually don't get those kind of strong tornadoes here, usually they are weak spin-ups. June 16, 2014. Two tornadoes I (or anyone else for that matter) didn't see coming to my town. I got spared, but I was one of a select few to be not impacted at all. (even as simple as a power outage). One of the worst storms I've ever experienced was in 1999 on the Ohio Turnpike westbound when I encountered a squall line. Was expecting the bad weather, because I'd heard talk about it on the Turnpike operations frequency for about thirty miles beforehand, and also got an alert on the local NWS frequency about it. Once the squall struck, visibility suddenly decreased - not zero-zero, but not the best either. Within about twenty seconds, as I noticed the water bubbling on the top of the pavement, a little voice told me to pull over immediately. Pulled up under an overpass at MM 52 and waited for the squall to pass. Once the rain tapered off to a light, but steady, flow, I resumed driving. Now, the reason I will ALWAYS remember the mile marker I pulled over at is because, as I passed MM 51, I encountered a serious four car crash that had just happened, most likely as the result of people encountering the squall and suddenly braking. To this day, I am still convinced that, had I not pulled over, I would have been the fifth car involved in that crash. Tornadoes, ice storms, blizzards, hail, high winds, drifting snow - I've driven through a bunch of bad weather. The worst was when I drove THROUGH a tornado. It was a weak tornado, but you could see debris circulating when we got to the middle of the storm. This was on AR 23 south of Booneville. Which is why we have an underground shelter in our garage. That was a wake-up call. Hurricane Wilma, when I lived in south Florida. Leaky roof, seven large trees knocked over, fence damaged, and eleven days without power...thankfully it was cool for the first 4-5 nights due to a cold front/pressure differential. Neighborhood was a complete mess, and 98% of South Florida was without power for the first 24 hours. Best part about it being able to see the Milky Way from my front yard, unaided (for the first two nights). Which were Charley, Frances and Jeanne. All three were taken down from the list along with Ivan. Frances was going to be removed from the list anyway due to a request by France (Who else?). I missed a day of work each from Frances and Jeanne, so they can't be recalled. I think one day back in 2004, we had a microburst event near Huson, Montana where a mobile home was toppled over to its side. It was the one my mother was renting. Everything inside just toppled over, some parts blew up in the air. The Missoula National Weather Service office couldn't officially determine that it was a microburst, but I do think it was. There were 70 to 80 MPH winds, maybe close to 90, not sure. The "snowpocalypse" event just recently in Western Montana in 1996 and in 2014 is another example I can think of. My dad was driving on I-80 near the highest point (east of the Mississippi River) in the Appalachian Mountains, in Clearfield County, Pennsylvania. This happened in '91 (my dad doesn't remember - he thinks in 1991, but I'm thinking of the blizzard in '93). It was a WHITEOUT due to Lake Erie AND the mountains. My dad moved at snail speed, and was completely unaware if he was driving on the pavement or grass. He could not see a road sign or ANYTHING (maybe about 6 inches in front of the windshield - after that, it was just white). He decided to pull up somewhere and stopped. In Ohio, the temperatures was so cold, that my dad's hand nearly stuck and FROZE to the metal door handle, due to nearby Lake Erie. Three (or one) year(s) earlier, my dad drove through a tornado, and parked under an underpass. It was the Ohio Valley tornado of June 1990. He (thankfully) never got hit, but was certainly concerned. Yep, I worked at KSC at the time and they shut the center down for all three. Stayed for Charley, ran from Frances then was forced to stay for Jeanne because I didn't have the funds to run to the Panhandle again. I can distinctly remember when Jeanne showed up not even two weeks after Frances and some jabrone police chief on the beaches was on TV telling people they had to leave and I'm screaming at the TV "WITH WHAT MONEY? We're all broke from running from Frances, you idiot!" Many of you probably have heard of Hurricane Iniki (Ee-NEE-kee) which devastated the Hawaiian island of Kauai in 1992 with 145 mph winds. (Steven Spielberg had just finished filming Jurassic Park before the storm hit and he and a bunch of the actors and crew rode out Iniki in a hotel basement. About a 2-second bit of footage of Iniki is in the movie.) My parents went through that storm, but I was back living in California at the time. A weaker, lesser-known hurricane hit Kauai ten years earlier. Called Hurricane Iwa (pronounced "Eva"), this one was still quite destructive, if not as nasty as Iniki. I went through Iwa and I still remember the walls of the house bending in and out because of the wind; it was as if the house was breathing (many Hawaiian houses are "single wall" construction as opposed to "double wall" like we have here on the Mainland). It was spooky wondering if the house was going to outlast the hurricane or the hurricane was going to outlast the house. My parents ran a business that rented bicycles and mopeds at the time; it was called South Shore Activities. Its location was actually across the road and a couple hundred yards inland from the ocean, but such was Iwa's fury that the ocean washed all the way to the business and floated it like a boat an extra twenty yards inland while the wind tore the roof off. The mopeds had been tipped over but otherwise sustained no damage and during the first days after the storm, we used mopeds to get around as it was easier to dodge the fallen trees, telephone poles, etc. I've been through just about all of it, from hurricanes (Hurricane Katrina survivor) to tornadoes (multi-vortex F3) to blizzards (several) to thunderstorms where the lighting was so heavy and intense it was practically continuous (Singapore). About the only thing I haven't directly experienced is a volcanic eruption, though I have come close to several active volcanoes (Chile, Italy, Philippines). As a driver? The worst, IMO, was the solid rain I went through on TCH 2 in New Brunswick on the way back from the Portsmouth meet in 2013. Around 30 mph, constantly correcting whenever I could see the side of the highway coming in my windshield. Thankfully, there were almost no other drivers. As a ski reporter, I've been through the nastiest snow storms, but I find that heavy rain hurts visibility so much more and is more sudden. I pretty much drove right into a curtain... except that the curtain lasted for over a mile. As a non-driver, the most damaging storm I've experienced was the 1998 ice storm in southwest Québec, eastern Ontario and NY's North Country. I lived smack in the middle of what they called the "Triangle of Darkness" and was out of power for over two weeks, despite my proximity with the Beauharnois power dam. Downed power line pylons were ubiquitous, though; some lines had to be rebuilt over several miles. The worst weather I've been through as a driver is this. Yes, folks, I drove in it, at the height of it, and saw plenty of thundersnow. Well, I didn't drive in it, but I experienced an EF-0 in the back seat of a car in April 2013. It took the awning off a gas station right behind us! I also walked in what were basically hurricane winds September 14, 2008, when the remnants of Hurricane Ike struck Ohio. Though it's a tossup, I'd have to say May 31st, 2013, the day of the infamous El Reno tornado is first. The road networks were jammed full of people fleeing after an OKC meteorologist panicked people in to leaving their homes. People were driving down the wrong side of the road on US 77 south of Norman with a possible tornado coming directly for where I was, which ended up not happening. Also, the vast amount of storm chasers trying to get across the Canadian River earlier in the day was a nightmare. A close second would be the April 27th, 2011 Alabama tornadoes. I was blown to the ground ahead of a developing tornado in the wall cloud stage (one of the weaker ones) going in to a gas station to take shelter. I thought we had tucked ourselves far enough north of anything that might develop, but ended up not happening. I looked up in the rear view mirror and I'm like oh crap. 2 of the people went inside immediately and myself and another person took a couple pictures briefly and were just heading in as well. The Phil Campbell tornado also knocked out power to northern Alabama and no one could get gas or food, even those areas not affected directly by the large tornado. Thankfully, I filled up 30 minutes before it happened and we were able to get back to Tennessee to get gas.